In the May issue of Golf Illustrated, I will illustrate how strengthening the muscles of the hands, wrists, and forearms can lead to a generation of increased control of the clubhead throughout the golf swing. This occurs because of the improvement in physical functioning of the involved muscles that control the head of your club (including the forearm flexors & extensors, finger flexors & extensors) as the clubhead travels directly down and through the ball at impact, as well as the general path your swing travels throughout the entire swing (backswing, downswing, and follow-through). 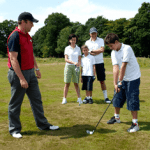 Imagine standing at the first tee, with your body (and mind) in better shape than ever before! Picture yourself holding a driver confidently in your hands and addressing the ball. Imagine your friends watching as you make a smooth backswing, then hitting the ball, sending it farther and straighter down the center of the fairway than ever before! YOU’RE ON YOUR WAY TO PLAYING ANOTHER GREAT ROUND OF GOLF! I know, I know……it’s easier said than done, but it’s true. Many people who have taken the time to see themselves play at their best follow that vision with the completion of their goal. In any sport, playing with confidence leads to success…..and playing with confidence doesn’t always come naturally — it takes practice, both physically and, yes, mentally by seeing yourself as being a winner!! Being physically fit gives you increased energy when you need it! 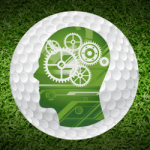 As a round of golf progresses, that energy becomes increasingly important as you strive to maintain both mental and physical control. 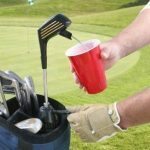 In addition, taking care of your body throughout your round (stretching and being sure to consume enough fluids) becomes so very important. Staying away from energy-robbing substances such as alcohol and caffeine, and taking in plenty of water (drinking at least 6 oz. every 4-5 holes) or sipping from your favorite sports drink throughout the round can help to maintain muscle balance, flexibility and control — more than you ever thought it could! In the March issue of Golf Digest, my “Pocket Tips Fitness Guide for Golfers of All Ages” illustrates simple stretches to do at home and before, during, and even after the round that can make the difference in your ability to remain IN CONTROL! This pocket-sized guide can convienently be taken with you as you play! The stretches are easy to perform and clearly described — so you can do them while your partners or teeing off, or in between holes, or even while you’re sitting in the golf cart. In conclusion, let me say this. If you are trying to play better golf and enjoy yourself more while you are on the course, take the time to take better care of your body and mind.